iJoy 200 / 245 / 250 / HT-2580 Robotic Human Touch Massage Chair Recliner by Human Touch - Chairs are IN STOCK for fast shipping! 90 lbs. / 92 lbs. 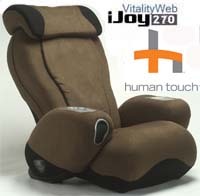 LARGER iJOY-250 Refurbished Massage Chair / Recliner with Human Touch Technology - Controller is Built-In to the Armrest. Microsuede Fabric and Manual hydraulic recline mechanism. More Velour and Faux Leather iJoy Chairs also available!! Chairs are STOCKED for IMMEDIATE shipping! - NO WAITING! Wheels to easily move the chair (Only on iJoy 250, 270). 4 Modes: Kneading, Compression, Percussion, Rolling. 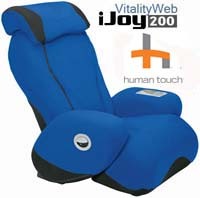 Manual Recline iJoy 200 / 245 - Backrest reclines back 170 Degrees. Electric Recline Only on iJoy 250, 270 & HT-2580 Below. Optional Ottoman 2.0 is available. Optional Otoman 3.0 is available. iJoy ZipConnect Massage Chair with Built-In Speakers & Subwoofer. 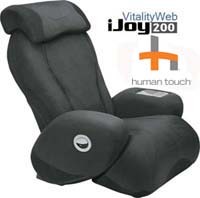 Luxurious iJoy® ZipConnect™ Massage Chair blends music and massage into the ultimate relaxation experience! iJoy® ZipConnect™ includes a FREE ZipConnect module (with convenient retractable 18-inch cable and mini stereo plug) for playing any iPod, MP3, portable CD or satellite radio — any audio source with a headphone jack! The universal FREE ZipConnect module is interchangeable with available Made for iPod modules that charge as they play. Listen to your iPod or MP3 through the chair's excellent built-in stereo speakers in the headrest and a powered subwoofer in the base. iPod and other audio sources not included. Excellent, product arrived on time and in perfect condition. - Chad P.
FREE PICK-UP AT OUR SAN DIEGO SHOWROOM! !